While the strong aroma of plants such as lavender and rosemary is undeniably alluring, sometimes the sweeter fragrance of a rose or a similar flower is more enjoyable. 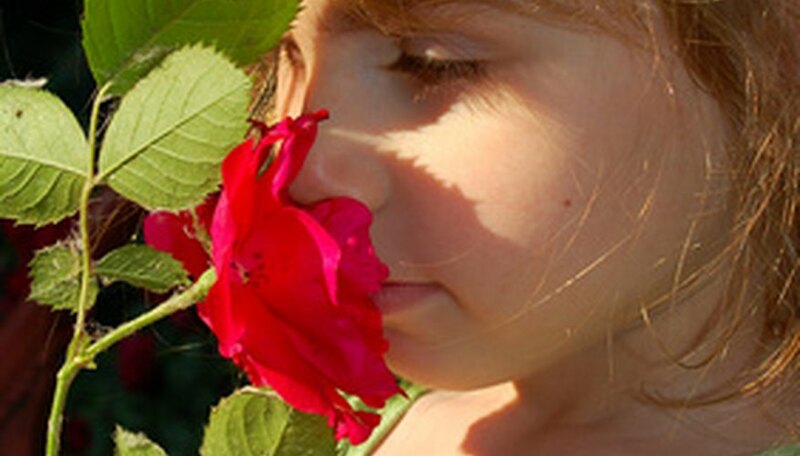 There are a number of flowers that smell sweet and can be cultivated in the home garden to add a lovely perfume to the outdoor air. Excellent for bringing hummingbirds and butterflies to the yard, Japanese honeysuckle (Lonicera japonica) is a fast-growing vine native to eastern Asia and Japan. Also called gold and silver flower, the vine is notable for its honey-scented, lantern-like white and golden yellow flowers. The plant is extremely adaptable, growing in almost any conditions in USDA zones 4 to 10. Japanese honeysuckle will tolerate just about any soil, in full sun or full shade. The nearly indestructible plant will also tolerate drought, and soggy, wet soils. Winter jasmine (Jasminum polyanthum) is an early-blooming evergreen vine that produces heavily fragrant, waxy white flowers. Native to southeastern China, winter jasmine is a fast-growing plant that can quickly reach lengths of 20 feet or more. The plant requires very little care, and can be grown with ease in USDA zones 8 to 10. Winter jasmine should be grown in frost-free areas for best results. The vine will grow in most soil types so long as it is watered occasionally. It will do fine in either full sun or partial shade. Summer sweet (Clethra alnifolia), also called sweet pepperbush, is a flowering shrub native to North America that produces creamy white clusters of sweet-smelling blooms throughout the summer. The erect shrub is also notable for its lush, lime-green foliage. Summer sweet should be grown in full sun or partial shade in USDA zones 4A to 8B. Summer sweet is best suited for well-drained, acidic soil that is kept consistently moist, even wet. The plant is ideal for those who desire fragrance as well as the presence of fluttering butterflies.